We (Matt had a say in it) picked this one because we love anything with Worcestershire (already liked it, but being in London a few years ago cinced it for me...they even had Worcestershire potato chips crisps). This is a super easy, delicious, and quick dinner. Everyone loved it and everyone ate well. What more can you ask for in a recipe? This salad was from a friend of a friend (Katharine's friend Libby) and once I tasted it at a dinner party, I was ready to move her to best friend status. It is wonderful and super easy. Heat a grill pan over medium-high heat. Coat pan with cooking spray. Sprinkle both sides of steaks evenly with salt and pepper. Add steaks to pan; cook 4 minutes on each side or until desired degree of doneness. Let steaks stand 5 minutes. Cut steaks diagonally across grain into thin slices. Combine mayonnaise, mustard, Worcestershire, and garlic in a small bowl, stirring well with a whisk. 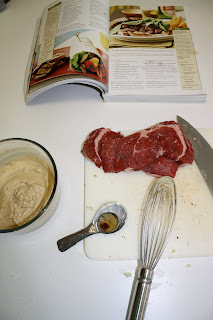 Spread about 1 tablespoon mayonnaise mixture on each of 4 slices of bread; divide steak evenly among bread slices. Top each serving with 1/4 cup arugula and 1 bread slice. "I just use frozen corn, avocado, mozzarella, and cherry tomatoes halved. Then I toss it all together with cilantro, lime juice salt and olive oil." I used the juice of 1 lime, 2 tbsp olive oil, 1 handful of cilantro, 1 avocado, 1 small bag of frozen corn (thawed but not "cooked"), 1/2 a big ball of fresh mozzarella, and half a pint of grape tomatoes. Guess what the Gibbs Family had for dinner tonight????? We loved the steak sandwiches and that mayo was yummy! I also made the corn salad! I used corn that I had frozen last summer...it was so sweet that I had to add more lime juice to balance out all the sweet corn goodness! I get Cooking Light and it's funny that I never saw that steak recipe. Probably wouldn't have made it even if I had. I love your idea of posting dinner ideas. I have GOT to get back to my blog! I've had several people asking me about it...time just slips away. Keep up the great work!